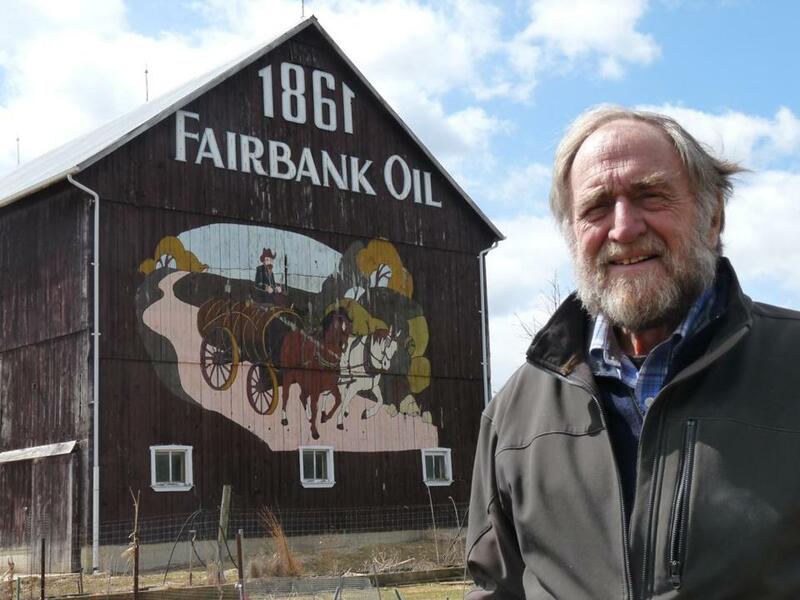 Fourth-generation oil producer Charlie Fairbank III had a mural depicting the beginning of Fairbank Oil in 1861 painted on his barn near Oil Springs, Ontario. OIL SPRINGS, Ontario — We spot the first wooden “walking-beam” pumpjacks nodding up and down in a farm field as we drive down southwestern Ontario’s Oil Heritage Road toward Oil Springs. In the heyday of Canada’s black gold rush, pumpjacks, spring-pole drills, and Canadian pole drilling rigs spread like a swarm of locusts across the gumbeds around Black Creek in Lambton County. Horses hauled wooden tank wagons loaded with “black gold” along a plank road from Oil Springs to the railhead in Wyoming. Later, a railroad spur was built to transport the crude oil to refineries in Petrolia. Today, the sultry smell of black gold still wafts over the Oil Heritage District, located a half-hour drive southwest from the Blue Water Bridge linking Port Huron, Mich., to Point Edward and Sarnia, Ontario. This year the Oil Museum of Canada, a national heritage site in Oil Springs, will celebrate the 160th anniversary of the discovery of oil at its Black Gold Festival on July 15 with musical entertainment, blacksmith demonstrations, and wagon tours to the adjacent working oil fields. The one-story white museum building, located at the corner of Gum Bed Line and Kelly roads, is surrounded by historic remnants of the early oil days, including the 1885 Oil Springs railway depot, the 1895 Langbank post office and a vintage blacksmith shop. Word of Ontario’s oil strike spread black gold fever throughout Canada and beyond. Pennsylvania oil speculators and European immigrants flocked to Lambton County’s mucky swamplands to seek their fortunes in the gumbeds. They quickly transformed Oil Springs and neighboring Petrolia from backwater settlements into thriving 19th-century oil boom towns with plank streets, lamplights, saloons and general stores. Inside the museum, we meet up with Charlie Fairbank III, a fourth-generation descendant of the world’s oldest petroleum-producing family and the president of Fairbank Oil. For decades, the Fairbank family has spearheaded efforts to preserve the oil heritage of Oil Springs, Petrolia, and Wyoming. Family patriarch John Henry (J.H.) Fairbank started pumping oil in Oil Springs in 1861, and his great-grandson has carried on the 157-year tradition using the same 19th-century technology to operate wells on his 600-acre property. Fairbank Oil produces 24,000 barrels of oil annually, and has been selling its crude to Imperial Oil Company for a century and a half. Fairbank wends his way around the museum’s displays of oil samples, early tools and drilling-rig models to a photo of his illustrious ancestor. Two years after drilling his first well, “J.H.” revolutionized the oil industry by inventing the “jerker-line” system. The simple contraption allowed a single steam engine ─ connected to multiple pumpjacks via a network of moving wooden rods ─ to operate dozens of oil wells simultaneously. J.H.’s cost-saving innovation propelled him to prominence as Canada’s largest single oil producer, a founder of Petrolia and a member of Parliament. In the museum’s theater, we watch a 12-minute film about the early days of the black gold rush in Canada’s Wild West. The road to oil riches was paved with hardship and mishaps. The first gusher, in 1862, sent crude oil flowing down Black Creek to Lake St. Clair, the watery divide between Canada and the United States, where it fouled the hulls of passing boats. Once the surface wells around Oil Springs were tapped out, drillers used nitroglycerine torpedoes to “shoot the well” and break through the limestone rock below ─ often with disastrous results. Oil field fires were common, sending flames and smoke 100 feet into the air. Canada’s relentless quest for oil reverberated around the globe. Between 1874 and 1945, 500 Canadian “foreign drillers” traveled to remote locales in 87 countries to open new oil fields and plant the seeds of petroleum production. An interactive display inside a large canvas tent transports visitors back to an era when the “Lambton boys” battled deadly mosquitoes, hostile natives, violent revolutionaries and brutal weather to drill oil wells in Borneo, Sumatra, Egypt, Russia, and Venezuela. In the basement, glass cases display trophies and trinkets, including Amazonian spears, a Borneo headhunter’s knife and a tarantula, brought back by the foreign drillers from exotic places. We wind up at the Fairbank family’s yellow farmhouse to admire their 1913 barn with its iconic mural of a man driving a horse-drawn oil tank wagon. Oil Springs’s oil boom went bust in 1866 when the first gusher was struck in Petrolia, drawing muckers and greasers eight miles north. Wealthy oil barons, including the Fairbank family, built elaborate Victorian mansions in Petrolia, which produced 90 percent of Canada’s oil for 40 years. To complete our exploration of the Oil Heritage District, we head to Petrolia, the “cradle that rocked the oil industry,” and park at the Farmers’ Market, which is a big draw during the summer. On Station Street, we step inside Van Tuyl & Fairbank Hardware, owned by the Fairbank family since 1865, to marvel at the nuts and bolts and gizmos and gadgets that have kept the oil business humming for 153 years. A stroll through Petrolia’s downtown takes us past the 1903 Victorian-style Grand Trunk Station (now the public library) with its dramatic red turrets. We stop at the gift shop inside the 1894 Olde Post Office before going to Victoria Hall on Greenfield Street, where we meet Laurissa Ellsworth, who gives us a quick tour. She tells us the 19th-century Queen Anne-style public building, notable for its clock tower, was rebuilt after a 1989 fire. Today, it is the home of Victoria Playhouse Petrolia, a popular summer theater that attracts 50,000 visitors annually. In the entryway, we admire two Oil Heritage stained-glass windows, presented to the town by Fairbank Oil. “Our oil heritage is a remarkable story that we need to keep retelling,” Ellsworth says. For more information about the Oil Museum of Canada, visit www.lambtonmuseums.ca/oil or call 011 + 519-834-2840. For more information about Petrolia, visit www.town.petrolia.on.ca or call 011 + 519-882-2350.